If you have the feeling that your life is stuck, that nothing seems to evolve, you only have to make chance and flow again by wearing a metal jewel in the shape of a wheel around your neck. 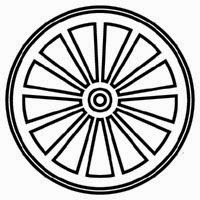 The wheel which is a universal symbol for renewal, destiny and the unravelling of events. It is one of the most explicit symbols for chance that exists. The tenth card of the Tarot cards is the one of the Wheel of Fortune.